If Warren Buffett is buying a stock, it's worth a look for investors. When Warren Buffett makes an investment in a company, it's worth a look for investors. And this month, there are some interesting investments he's made through Berkshire Hathaway (NYSE:BRK-A)(NYSE:BRK-B) that are surprising and may be worth a second look. 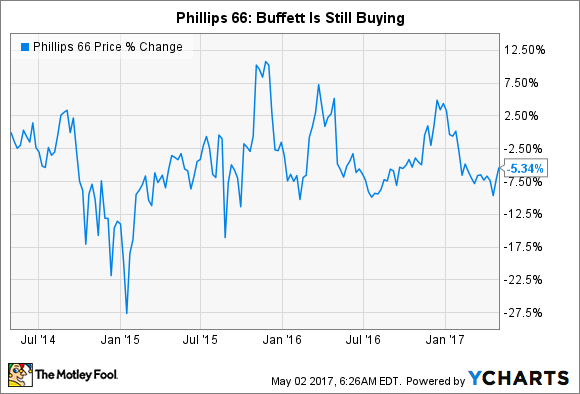 Three of our contributors dove through Buffett's holdings and think General Electric Company (NYSE:GE), General Motors Company (NYSE:GM), and Phillips 66 (NYSE:PSX) are the three Buffett stocks investors should be buying this May. Reuben Gregg Brewer (Phillips 66): A few years ago, there was a big change in Berkshire Hathaway's portfolio: international oil giant ExxonMobil (NYSE:XOM) was sold and Phillips 66 was added. This was a notable move because it shifted the portfolio's energy investment away from oil drilling, a big part of Exxon's business, and toward refining, pipelines, and chemicals, which is basically all Phillips 66 does. Many of the assets it owns or controls would be hard, if not impossible, to replace or replicate, giving Phillips 66's business a valuable and protective moat. Meanwhile, the company's assets are a mix of fee-based businesses (pipelines) that provide stability and spread businesses (refining) that can provide upside when oil prices are low or falling. While refining assets can struggle when oil prices are on the rise, Phillips 66's balanced approach has allowed it to raise its dividend every year since it became a stand-alone entity in 2012. The current yield is roughly 3.2%. Growth, meanwhile, is set to continue, with growth spending of roughly $2.4 billion planned for this year alone. That will help bring key chemical, refining, and pipeline projects online later in 2017 or 2018. And with debt at roughly 30% of the capital structure, Phillips 66 has the financial foundation to fund those investments and more in the future. The stock is down around 5% (or so) over the last three years, but with an expanding business now could be a good time to jump on Buffett's coattails. He's been adding to his position over the last couple of years. Tim Green (General Electric): GE is a small part of Berkshire's portfolio, with the stake valued at just $300 million. The company has transformed itself since the financial crisis, shedding most of its vast financial arm and refocusing on its industrial businesses. About $200 billion of assets were slated for disposal, a massive undertaking for the century-old company. GE is now billing itself as a digital industrial company. It's making a big bet on software and the cloud, building out its Predix industrial cloud platform. The software business produced $5 billion of revenue in 2015, and GE is targeting a whopping $15 billion of revenue by 2020. That would put GE among the largest software companies in the world. Buffett is most likely drawn to the industrial businesses, but it's the software push that makes the stock an interesting investment. Analysts expect adjusted earnings per share of $1.63 this year, putting the forward PE ratio just shy of 18. That's not bargain territory, but there is the potential for margin expansion as the software business grows. GE also pays a solid 3.3% dividend, making the stock attractive for dividend investors. GE stock isn't a screaming bargain, but a reasonable valuation and a generous dividend make it a Buffett stock to consider. Travis Hoium (General Motors): Warren Buffett has moved into some industries he doesn't normally touch recently, including autos and airlines. And on the auto side, I think his $1.8 billion position in General Motors makes it worth a look this May. GM presents a rare value on the stock market, trading at just 5 times trailing earnings, the kind of value Warren Buffett would love. But we're also likely at a peak in sales for the auto industry, so that might be an artificially low valuation for investors with a slightly longer term look at the business, like Buffett would have. What makes GM interesting today is that it's a leader in EVs, autonomous driving, and ride sharing. On the EV side, it's the first to make a mass market all-electric vehicle in the Chevy Bolt. In terms of autonomous driving, it's in a great position after buying Cruise and further developing the company's technology (see an amazing demonstration here). And the $500 million investment it made in Lyft before its competitor Uber began shooting itself in the foot may end up looking genius over the long term. To top it all off, GM pays a nice 4.5% dividend yield, another quality Buffett loves. The auto business hasn't traditionally been a big moneymaker for investors, but Buffett is betting that will change, and maybe we should too.